Full solar SW home with 4BD, 4.5 baths, 3 car RV garage, with in-ground heated pool and automatic cover. Great room and dining areas include solid wood beams, tongue and groove cathedral ceilings, vigas, commercial wood floors, and extensive Colorado flagstone. The chefs dream kitchen features granite countertops, island with prep sink, professional stainless steel appliances, 6 burner gas cooktop, 2 dishwashers, double ovens, custom cabinetry, and a 12x11 walk-in-pantry. The master bedroom has its own pretty fireplace and sitting area. The tiled ensuite bath includes a deep tub, double steam shower, granite countertops, and 2 big walk-in-closets. 3 other large bedrooms each have their own baths. A bonus home office space with custom cabinetry and shelving, and an additional 30x24 game/media room too. 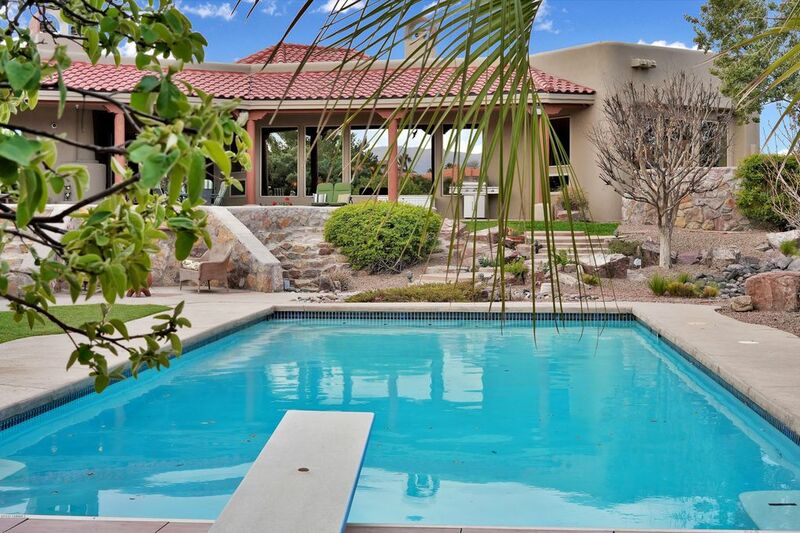 Paradise overlooking 1+ acre of easy care landscaping, with a 12'x 65' covered patio areas with breathtaking views of both the Organ Mountain and sunsets with city lights.